The Volume Weighted Average Price (VWAP) is used to reveal the true average price that a stock was traded at during any given point in the day. The formula is simply a matter of dividing total dollar volume by total share volume. The VWAP is often seen as a benchmark price to gauge whether traders are overpaying or underpaying for their shares relative to everyone else. Institutions and pension funds often utilize VWAP to grade the quality of their order fills. Generally if orders are filled under the VWAP, it is considered a well-executed trade. Shares purchased above the VWAP are considered overpaying. While this is popular thinking, it can be a bit too simplistic. Buying shares long under the VWAP may seem like a bargain initially until the stock continues to crater on a strong downtrend. The magnitude of the distance from the VWAP that shares are purchased or sold naturally is a key factor. However, it must be tempered with other indicators when day trading. The VWAP can be used like a moving average line. 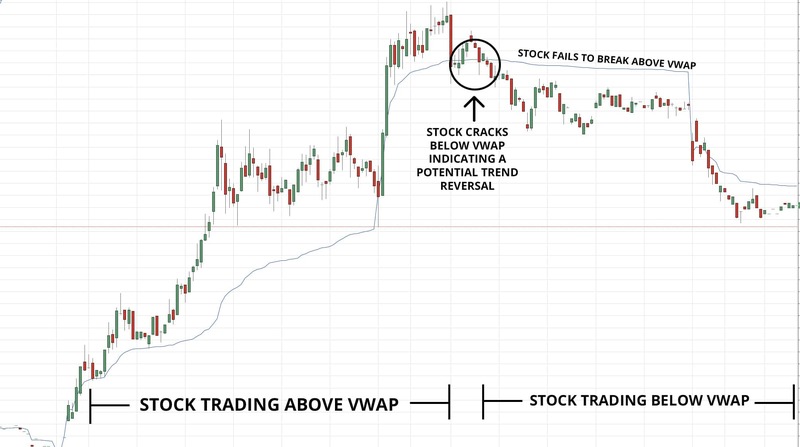 A falling VWAP indicates a price downtrend and a rising VWAP indicates a price uptrend. Traders often use it as a support and resistance line as it continues to re-calculate continuously every minute from the 9:30am EST. open to the 4:00 pm EST. close. VWAP is factored into numerous algorithmic and high frequency trading programs. Many brokers offer VWAP guaranteed order fill services not only to institutional clients but also retail investors. It is a passive tool for investors to accumulate shares at a perceived bargain price. Of course, whether it is truly a bargain is determined by the extent and magnitude of the bounce above the VWAP. Keep in mind that VWAP resets every morning ahead of the opening bell at 9:30 am EST. What may have been a good price yesterday, can turnout to be a lousy price today, especially if there is a significant news-related gap up and down. VWAP is especially useful when a stock closes sharply higher but the light volume indicates the average price paid was much lower. This can be interpreted as sign of thinner liquidity rather than huge demand that caused the price spike. A seasoned trader might wait for a reversion to purchase shares or even considering selling short for a reversion back to VWAP.